Austin, TX (SXSW Interactive) – March 11, 2012 – Geoloqi, a powerful platform for next-generation location-based services, today announced strategic new partnerships with Appcelerator, a leading cross-platform mobile development platform; Factual, a large-scale data aggregation platform with a Global Places API; and Locaid, the world’s largest carrier location platform. Through these partnerships, Geoloqi is significantly enhancing its location data and analytics offering while expanding its reach to millions of new developers and end users through Locaid and Appcelerators’ customer bases. Geoloqi is a complete cross-platform location solution that is device, language and carrier agnostic allowing developers to easily layer geolocation onto any IP connected device or application. Geoloqi is creating a one-stop shop for the enterprise and developers to unlock the full potential of real-time location-based services. These strategic partnerships not only give Geoloqi a distinct advantage in location data and application development services, but also give carriers and handset manufacturers new technology for true real-time location tracking, for the first time. The platform also enables persistent background location tracking, real-time location tracking, intelligent battery management and geofencing, rich location and dwell-time analytics, and location messaging. Winner of the 2012 GSMA Global Mobile Award for “Best Cloud-Based Technology,” Appcelerator’s Titanium is the leading mobile platform that powers more than 35,000 applications deployed on 40 million devices worldwide. Through the partnership, the Geoloqi API and complete toolkit is now available in Appcelerator’s marketplace, giving its customers access to rich, real-time location technology while giving Geoloqi access to Appcelerator’s global network of over 1.6 million developers. Factual has created the definitive global location database of local businesses and points of interest, and currently offers access to 60 million entities in 50 countries. Geoloqi’s partnership with Factual gives customers access to Factual’s immense location database and significantly extends Geoloqi’s data and storage capabilities. Locaid is the world’s largest location-as-a-service company. The partnership gives Geoloqi access to its over 350 million mobile devices in North America, and gives Locaid’s enterprise customers real-time handset-based location technology, greatly enhancing the carrier-only location services previously available. Geoloqi is a powerful platform for real-time location based services, making it simple for enterprise partners, OEMs and mobile developers to quickly add rich geolocation functionality to apps and devices. It provides a complete, real-time toolkit for tracking, messaging, battery management, geofencing, storage and actionable analytics, with a language agnostic SDK and proprietary API. 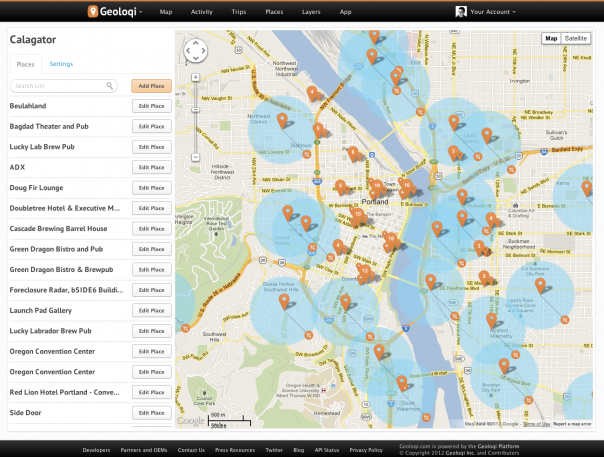 Founded in 2010, Geoloqi is based in Portland, Oregon and backed by Portland Seed Fund and TIE. For more information on Geoloqi, please visit geoloqi.com. Appcelerator’s Titanium is the leading mobile platform of choice for thousands of companies who are seizing the mobile opportunity. With more than 35,000 applications deployed on 40 million devices, Appcelerator’s Titanium Platform leverages over 5,000 mobile device and operating system APIs to create native iOS and Android apps as well as HTML5 mobile web apps. Customers who standardize on the Titanium Platform get to market 70% faster and can quickly optimize business results with analytics–driven insights into user behavior and app performance. The open and fully extensible Titanium Platform makes it easy to integrate data, content and services from a variety of sources into mobile applications to leverage best–of–breed capabilities. Appcelerator Cloud Services (ACS) provides instant social, location, communication and content features for user-centric mobility. ACS is pre-integrated into the Titanium Platform and is also separately available for all mobile developers and publishers. Appcelerator’s worldwide ecosystem includes 1.6M developers and hundreds of ISVs and integration partners. Please visit appcelerator.com. Factual is a large-scale data aggregation platform that provides high value data and services to developers, publishers and enterprises. The sources of data come from premium partners, developers, user communities and the web. Its core offering is a powerful set of open APIs around Global Place data which includes more than 60 million businesses and points of interest in 50 countries. Factual was founded in 2007 by Gil Elbaz, co-founder of Applied Semantics which originally developed ASI AdSense. Factual is funded by Andreessen Horowitz and Index Ventures. For more information on Factual, go to www.factual.com. Locaid is the world’s largest Location-as-a-Service (LaaS) company. We operate a location privacy platform that allows mobile developers to locate over 350 million devices for enterprise authentication, fraud management, consumer location services and opt-in mobile marketing. Locaid locates smartphones, feature phones, tablets and any mobile device on leading wireless carriers, including América Móvil, AT&T, Rogers, Sprint, T-Mobile, TELUS, and Verizon Wireless. Locaid also helps shape and enforce location privacy policies via leadership roles on governing associations, including the CTIA, MMA and IAPP. The largest financial institutions, mobile marketers, M2M platforms and mobile service providers get network location from Locaid. Location Matters.™ You can locate us at www.loc-aid.com. 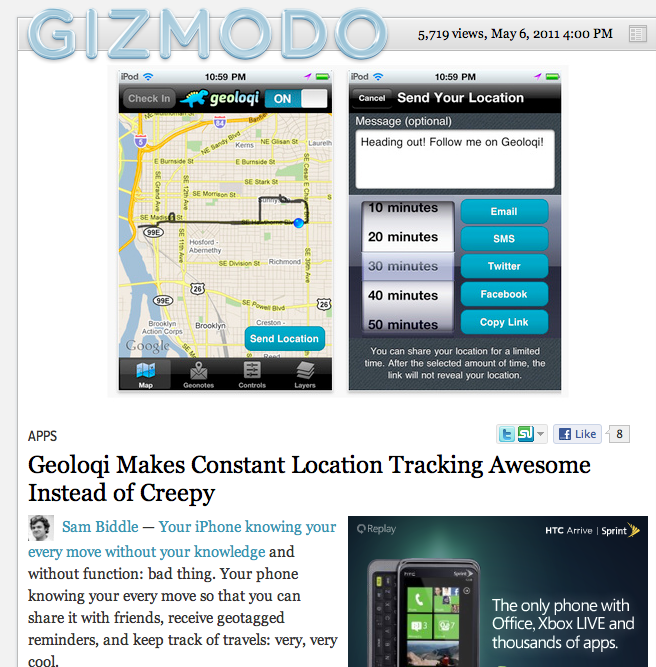 Today at about 3PM EST, Geoloqi was covered by Gizmodo. Our servers quickly fell under the resulting account signups and location data. We quickly worked to scale them up so that the service could be resumed. Thanks to everyone who downloaded the app! The version out now is very beta. We’re working to improve the user experience, battery life and features. If you have any suggestions, please contact us at feedback at geoloqi dot com! 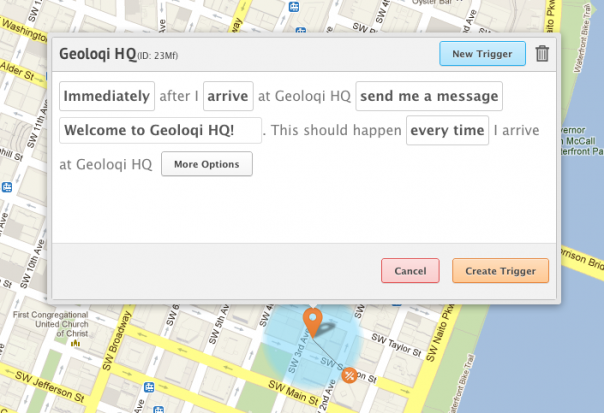 Geoloqi is an “opt-in” app, meaning that it allows you full control over your location and who you share it with. We plan on rolling out many more features, which you will find in the layers section of the app. If you’d like to build your own Geoloqi layer, or an entire application based on the Geoloqi platform, you can check out the API. Follow @geoloqi on Twitter for more!